General Motors engagement in stock car racing in Brazil is celebrated in this print advertisement featuring the Chevrolet V8. “A Chevrolet just like yours lives under our stock cars. Stock Car and Montana Cup, May 23rd, in Nelson Piquet International Autodrome”. The V8 series has combined Stock Car Light (Copa Vicar) and Stock Car Pick-Up Racing categories, for a nine-round championship. The Nelson Piquet circuit is earmarked for demolition, to prepare for the 2016 Summer Olympics. 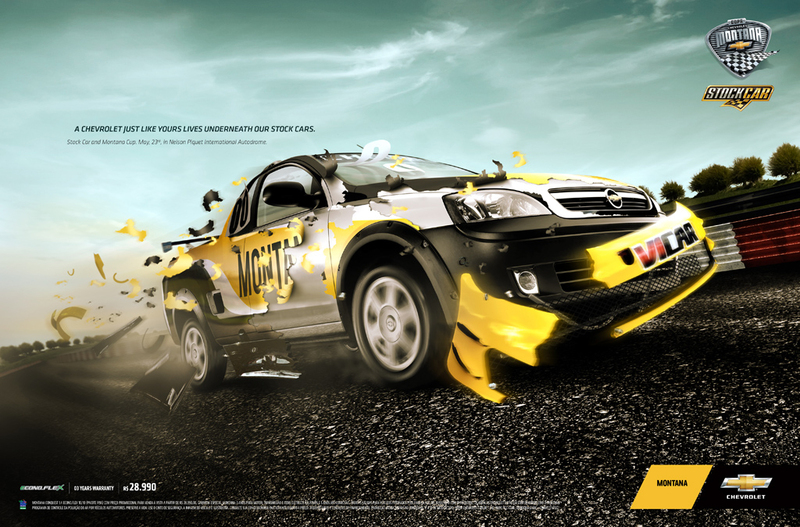 The Chevrolet Montana Cup campaign was developed at Binder Visão Estratégica, Rio de Janeiro, by creative director Alexandre Motta, head of art Marcus Saulnier, art director Marcelo Andrade, copywriters Pedro Drable and Leandro Euzébio, RTVC: Marcela Santos, account team Carlos Bailly and Guilherme Brum.